I recently had a chat with David Brin about climate change and storytelling as well as where our world is headed. 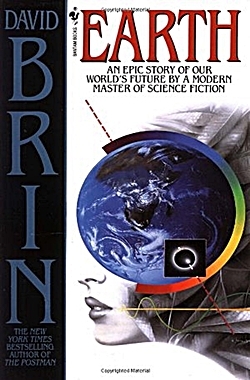 David Brin is a science fiction author, scientist & transparency/internet security expert, public speaker & business/governmental consultant, and blogger/social media influencer. But he’s so much more. To find out more about David, please visit his Books page and his blog, Contrary Brin. Mary: What ideas do you have about modern storytelling involving climate change and other environmental catastrophes? Have you read any novels in this field that you really like, and why? Can you talk about some of your novels, like Earth, that fall into this category? David: There were ecological warning tales before Earth! The movie Soylent Green and the novel it was based on – Harry Harrison’s Make Room! Make Room! – recruited millions of new environmentally committed citizens. Rachel Carson’s Silent Spring and Where Late the Sweet Birds Sang, by Kate Wilhelm, foreshadowed critical decision points. But yes, Earth is credited with giving some boost to public discussion of climate change and extinction and other issues. John Barnes’s novel Mother of Storms was a provocative warning. More recently of course you have many climate fiction works like Robinson’s New York 2140. And, of course, my own more recent – Existence. Mary: Thanks, David. Readers wanting to find some of the earlier literature, David’s and other authors’ novels included, can check out our database. As of today there are 500 books listed, and this is only a sampling! You’re an astro-physicist, which means your science fiction is richly knowledgeable. I’ve read your thoughts on “what if” we live in a computer simulation built by our descendants, who will have immensely more computing power than we do today. When I try to imagine this, I’m wondering if these future people who would be creating “our” world might miss the natural world that is shrinking around them, that may be mostly gone in their lifetime, and maybe these creators want to relive our time to figure out why we weren’t more preventive in this catastrophe. Your short story “Stones of Significance” taps into computer simulation. Care to talk more about it? David: Imagine you are a member of a mighty future civilization that can model the world with great precision. Will your only goal be to acquire more power, the way elites did all through the human past, and the way many elites do, today? Or perhaps your culture will have grown a bit in wisdom, too, and their goals might change? Take the way that our own values have changed. We have spent a century expanding our definition of “fellow citizen” to include groups who were formerly despised. Is that because we became rich enough to be satiable, and thus more fair and sharing? Or because we came to recognize the strength and power that come from diversity and a wide stance? What amazes me is how few readers and writers and directors of science fiction tales ever show a future in which this gradual augmentation of wisdom has continued! Star Trek maybe. Spike Jonze’s movie Her. A few others. I try to capture the notion, now and then, as in Stones of Significance. Mary: I’ve read some of your recent ideas about robot empathy crisis. I got really emotional during movies like The Iron Giant and Chappie, so think I’d be joining in the robot empathy parade or at least waving a sign on the sidelines. Can you give a few other predictions for the next 15-20 years, in terms of environment and technology around the world? David: I should give them away to you … for free? This is my stock in trade and my living! But sure. I give 5 to 1 we won’t be meeting aliens any time soon, except those of our own making. 2 in 5 that we’ll fail our current test of saving democracy. We’ve managed to save every single species of whale, so, unless some sudden ecological break occurs, I predict we just might squeak by. Oh, and Elon will miss his Mars target… by one year. Here’s a whole Pinterest index of articles on a wide-ranging variety of futuristic topics. Mary: Thanks for the freebie! 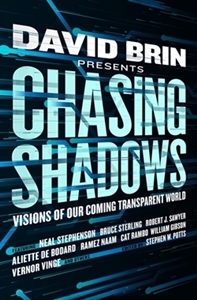 Your most recent book (with Stephen W. Potts), Chasing Shadows: Visions of our Coming Transparent World, is about surveillance in the modern era, but not just from governmental bodies–from every body. Do you see our world becoming more transparent now? And what were your conclusions about judgment vs. empathy in this world? 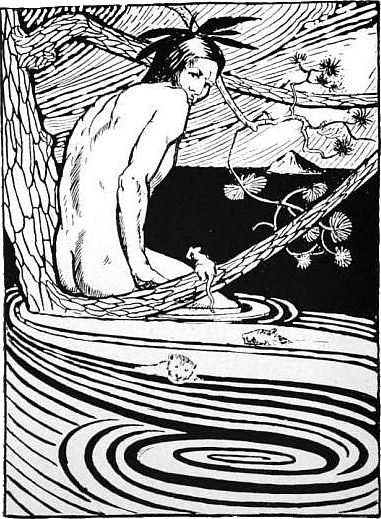 How do you think fiction plays into this surveillance and transparency, especially regarding the natural world and the kind of subjects eco-fiction would entail. David: Ever since The Transparent Society came out, 20 years ago, I’ve been “Mr. Transparency” when it comes to law, privacy, secrecy, and tech trends. There’s hardly time to go into it now, though folks can find a plethora of articles and speculations about transparency, freedom, and technology at The Transparent Society. The short of it is that we did not get our current, unprecedented levels of freedom and privacy by cowering and hiding from elites. We did it by using the available technologies of our time to see better! For citizens to better supervise and look back at the mighty. These technologies are already working for us, at the level of the street. They are helping us to grow more empathic – even as some forces in society seek to reverse that progress. Mary: This is good to hear. I consider you one of the greatest thinkers of our times, so I just wanted to ask: what are you most excited and energized about right now? And what worries you the most? David: I am excited about how solvable most of our current “crises” may be, if only we rediscover our confidence as a can-do, problem-solving civilization. If we get over our current addiction to self-righteous hand-wringing we’d realize how much is still in our favor, assuming we choose to negotiate with each other again, instead of screaming. Try reading Steven Pinker’s The Better Angels of our Nature and Peter Diamandis’s Abundance. We face terrible problems and challenges. But they will only be solved by people who look at what we’ve already accomplished – like reducing child poverty and saving the whales, and learning from those victories how to do much more. Mary: I like ending this on a positive note. Thanks, again, David, for taking time to chat with me.